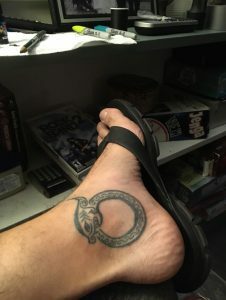 FAQ: Did You Get Any Tattoos At The Convention? Why Are You Tattooing Yourself? | Welcome to the EvoS Consortium! ← Does firelight influence sleep quality? 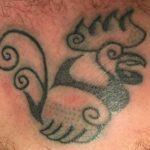 FAQ: Did You Get Any Tattoos At The Convention? Why Are You Tattooing Yourself? All summer after our fieldwork for the Inking of Immunity project at the Northwest Tatau Festival (see video about our project here and follow along on Facebook here), I was asked the same two questions: did you get any tattoos at the convention? And, why are you tattooing yourself? This post is the FAQ to answer those questions, because people seem to find the answers (and the sausage that goes into the science) interesting. Did I get any tattoos at the Northwest Tatau Festival, where around 100 tattooists were working, including some of the most celebrated Polynesian and traditional tattoo artists in the world? that were being done took several days, starting before the convention and extending through and beyond it. You know all those tattoo artists and are doing this research—you don’t get any freebies? was for, but we still need more money to assay the samples, so that’s a negative. Why are you tattooing yourself? My answer to this question is longer. After the last year of watching and learning about hand tapping and thinking through some of the issues underlying our study, I’ve become intrigued with the mechanics of tattooing, not just the biological mechanisms of the immune response (Do different techniques affect immune response different? Does how much it hurts matter? Do different inks matter? A friend of mine noted the issue with carriers and immune response). 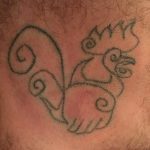 While conducting the crowdsourcing campaign on Instagram, I went down a stick-and-poke or handpoke tattoo hole as well. 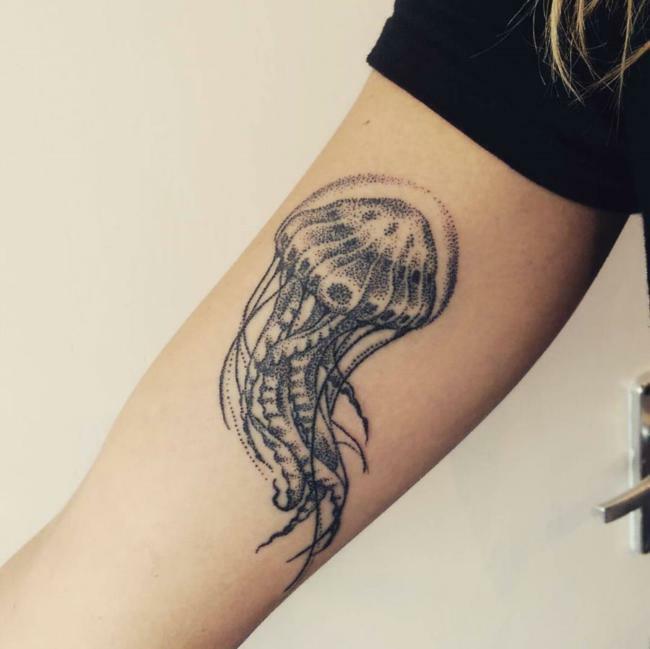 Handpoke tattoos are fashionable at present. Many of you learn about handpoke and recognize them for their previous slang derogation—jailhouse tattoos. And, indeed, if you search handpoke tattoos or stick-and-poke tattoos on Google or Instagram or Pinterest, the aesthetic among many of the twentysomething EuroAmerican hipsters out there doing it is, get drunk with your friends, draw designs, tattoo them on each other. They tend to be small, ironic, and potentially embarrassing. 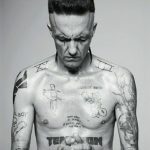 However, they’re also quite popular and prominent in music culture, from Ninja of Die Antwoord to Post Malone. But when I went down the Instagram hole, I found some really amazing handpoke stuff too. It simply looks different than work done with multi-needle tattoo machines. I became interested in what could be done, the inks that were being used, how deep people were going, how it felt, and if I could understand traditional hand tapping better by tattooing myself. In other words, a little participant observation meets autoethnography. And, to me, the aesthetic came to have a certain brash appeal. And of course with YouTube, we can figure out how to do almost anything nowadays (there’s a great series called AfterPrisonShow on how to make jailhouse tattoo guns and how to teach yourself to use them to become good). I picked a design I like and thought I could pull off and a part of my body I didn’t care if I screwed up on. 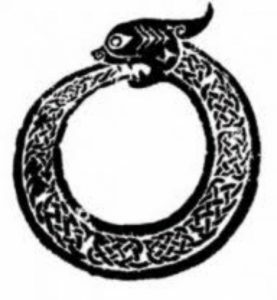 I tend to be ambitious, even when doing things for the first time and know I have a decent hand for art, so I chose an ouroboros design. 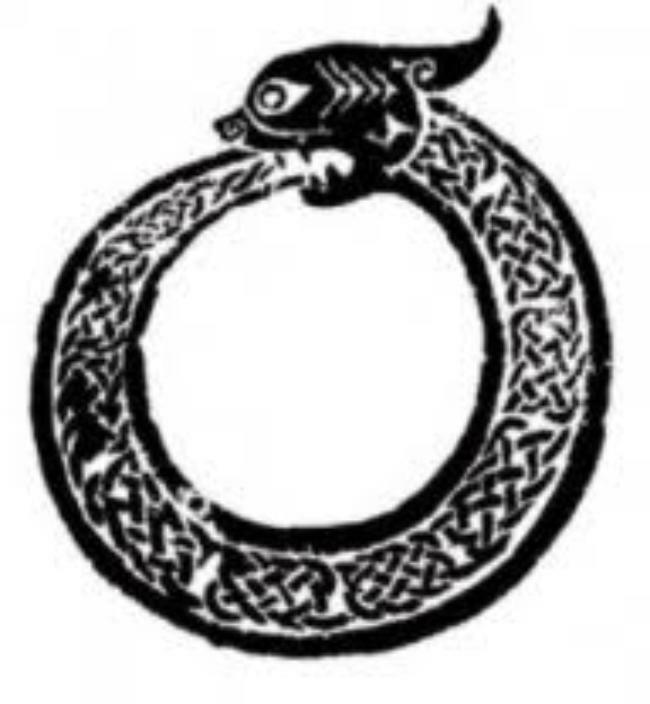 I’ve always loved the symbolism of the ouroboros and feel like life—and particularly our consciousness (see the book I’m writing for more on this)—is a tension between devouring ourselves and thriving. It’s death and birth literally, it’s the cycle of the day, cycle of the year, winter vs. spring, you name it. I chose to try to make this ouroboros design for my very first self-handpoke tattoo. 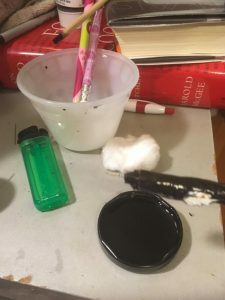 For the first one, I started with a sewing needle taped to a pencil with a bit of thread wrapped around the end as an ink reservoir and non-toxic, water-soluble blotter ink. The ink was very thick, almost like toothpaste. I shaved the spot on my ankle, then cleaned it with alcohol on cotton balls. (Those cotton balls end up getting stringy and make a mess. The pads used to remove makeup are much better, but I discovered that later.) I bought a light blue thin tip sharpie to draw the design on, but it didn’t work. I had to revert to a regular ink pen. The trick I eventually learned is that as soon as I start wiping away extra tattoo ink to see better, I wipe away the drawing. Therefore, it’s best to get enough pokes to make an outline before wiping it all down and losing the drawing. It can be redrawn, but if you’re using a stencil and not drawing by hand or aren’t steady and accurate with your drawing, you might be in trouble—again, stuff I would figure out along the way.) Before wrapping the thread around the needle, I sanitized the needle with the flame from a lighter, then cleaned it with alcohol. 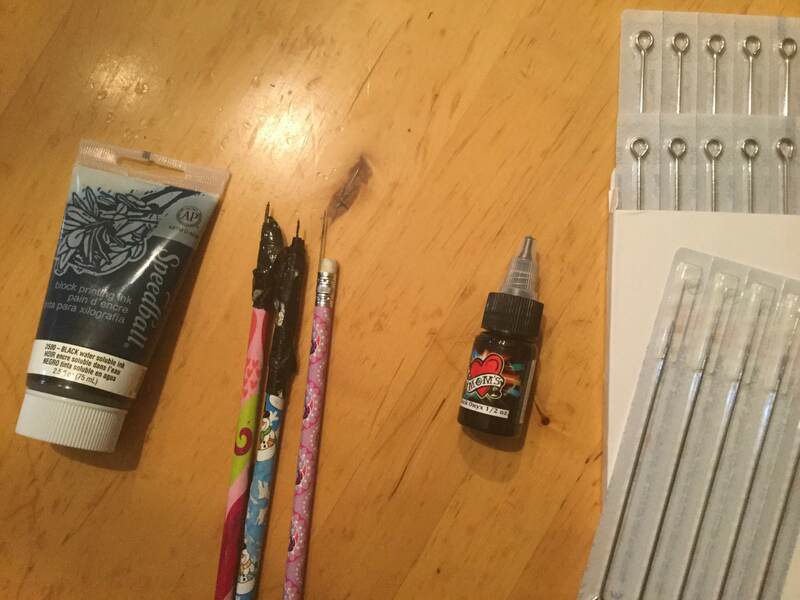 My first handpoke kit. Note: There’s a reason tattoo artists use those little plastic caps to put ink in and stick them in petroleum jelly. This lid is way too big to use to dip, and it moves around too much without something to stick it in place. That first night, I could not get much of the pasty ink to go in. It was too thick and didn’t flow well, so I accomplished an outline of my design, but it was a raw red outline of punctures. The punctures were not deep and not exactly bleeding, as I was tattooing my inner ankle, and only going about 1-2 millimeters deep, but that spot is apparently very sensitive, and it hurt so bad after an hour or so that I had to stop for the night. This problem led me to wonder what carriers are and why people had mentioned that. So I investigated, and it turns out there is pigment, which varies in density and brilliance, and there are carriers, which hold the pigment and interact with your skin. For instance, alcohol is a good carrier because it moves into skin. And it’s antibacterial. If you watch tattoo artists set up, many will squirt a little alcohol or alcohol-based soap into their ink to get the viscosity they want. So then next night, I played with that, which worked much better. I also tried working with two needles. Most tattooing is done either with machines using various needle configurations to cover more skin faster or various head lengths when hand tapping. I put two sewing needles close together to see if I could speed up this process and make heavier outlines. However, the sewing needles aren’t thin enough to do this well, and I toggled back to the single needle after a time. Also, I don’t think my blotter ink had much pigment, because I had to keep going back over and over the same areas to get enough ink in for the design to show. I did this again until it hurt so bad I couldn’t stand it anymore. I tried a couple different configurations with the sewing needles, playing with different diameter needles and doubling needles. 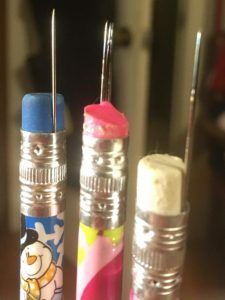 Many hand tappers simply use tattoo needles and tattoo ink, since they are so cheap and readily available on the internet. So I decided to wait till it healed up and go over it again with tattoo ink. And, indeed, I found a bottle of black and a box of 20 sanitized individual needles for $6 each ppd on eBay. First handpoke effort, using sewing needles and blotter ink. Now, in the meantime, all the data collection I’ve already written about happened. Let me recap some of what I’ve written about over on our crowdfunding site, at least the part relevant here. After the 2nd day in Seattle/Tacoma, I believe, of watching Su’a Petelo Sulu’ape (affectionately known by the tatau community as “The Old Man”) administer malu, Mua of Paka Polynesian Tattoo, the shop hosting Su’a Petelo and his son Su’a Paul Sulu’ape, told me to go out and chat with the Old Man. “He’s been drinking so he’s in storytelling mood. Go have a drink with him.” (Also, as later would become apparent, the Old Man is a high-ranking matai, or chief, and, really, probably equivalent if not literally the Paramount or high Chief of the tatau community, so everyone is expected without needing to be told to go pay their respects to him—this was a way of telling me to pay my respects). It was just me and the Old Man outside the shop, and I asked him about the tool innovations Su’a Peter (another of his tufuga or master artisan sons) had told me about the previous year. The Old Man reiterated the stories of those innovations in great detail. Then I asked him about his inks, since I know Intenz has branded an ink in his honor called Suluape Black. He said the Intenz guys marketed that ink with his blessing based on his ink formula, which he developed personally. He told me about the formula he and his brothers were using to make ink and the secret change he personally had made to get a darker black. I commiserated that I’d played with blotter ink and alcohol to try to understand the issues he’d been facing and showed him my ankle tattoo. This is what got me thinking more about the importance of pigment and what specifically is used as the carrier and how some carriers may dilute or dull pigments more than others or cause them to seep out into the surrounding skin (for instance, I’ve noticed that using alcohol to wipe mine down seems to facilitate the ink to spread out over a broader area, so that there appears to be a grey shadow around my tattoos where the ink has bled beyond the boundaries of the tattoos themselves). Stick-n-poke kit #1 (left) and kit #2 (right). because it is one poke at a time. I have experimented again with multiple needles bound together, which I often start with for the first go-round before I wipe down and no longer need the drawing to work from, but I prefer to work with the precision of a single point. Don’t get me wrong—the inner ankle was still really painful, especially the more distal part. The next piece I did was much quicker. 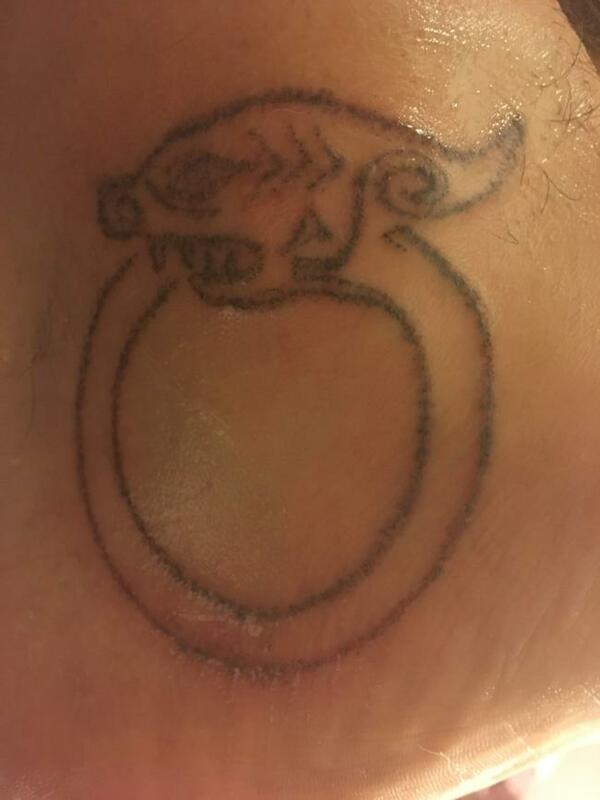 Re-done ouroboros tattoo with a bit of my revised kit above. I sketch with the yellow sharpie, then go over it with the green to get the lines right and ensure I can see them. 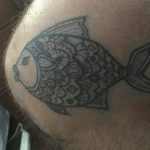 For years I’ve wanted a rooster and a fish on my knees. My rule of thumb (which I’m violating literally left and right [both my legs, get it?] lately). 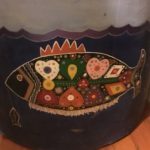 When my wife and I were trying to have our kids, I was in a painting phase where I was using acrylics and painting designs on our furniture (e.g., filing cabinets). I painted several with magical symbols of fertility I found in a coffee table book of cross-cultural magical icons. 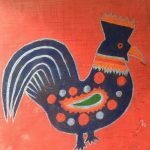 I painted three roosters and three fish, and we ended up with three babies. (Maybe I painted them during the pregnancy, knowing I had three on the way—I don’t recall. My point is that these were important to me and have remained so.) 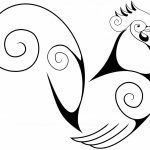 Therefore, my next tattoos were a rooster on the inside of my left knee (it’s easier to reach the inside when one is tattooing oneself, and it’s less subject to distortion when flexing) and a fish on the inside of my right. Most handpoke tattoos tend to be small, but as I noted previously, I tend to be ambitious and enjoy the detail work, so they both ended up larger than first intended. However, I like them, so why not? I painted this magical fertility symbol years ago when we were trying to have our kids, but I didn’t have a photo of it handy when I went to do my tattoo. I found this photo in an obscure place, so I can be sure no one else has used this image–the internet. Eh, what do I care at my age? Finished rooster. I did the shading on the coxcomb on accident but really liked it, so now I know how to shade. And I like the dot design on the wing a lot too. This is my fave so far. 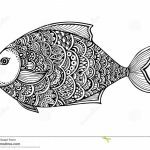 This is the fish I painted years ago, but, again, I wasn’t home and didn’t have a photo of it handy when I did the tat. But I did something similar. Clip art. So. Lame. But who cares? I liked the design. The last one I’ve done to date is something I picked from handpoke flash on the internet. I used to hate flash as unoriginal, but through my research I came to appreciate the Americana style like old Sailor Jerry stuff, and of course Sailor Jerry has become one of the markers of the rock’n’roll, punk, rockabilly, greaser, gearhead, Rat Fink, tattoo subculture I’ve identified with throughout much of my life. So the last one I share with you is “vita brevis,” which I placed on my inner left calf. 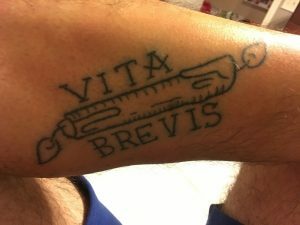 Vita brevis means “life is short,” and it’s a candle burning at both ends. The full quote, attributed to Hippocrates, is “ars long, vita brevis” or “art is long, life is short,” and perhaps I’ll do an art is long tat on the other calf, but school has started back up and I’m back in Alabama with a thousand other projects calling to me and saliva samples from the field season to get analyzed, so who knows when that will happen. (Art is long, but) life is short. One funny thing that won’t happen is that several of my students have seen my tats (handpoke is popular, I’m telling you, so many have them) and not only asked me to tattoo them but offered to pay me to do it. Not. Gonna. Happen. 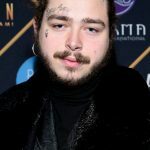 This entry was posted in Anthropology, Biological Anthropology, Christopher Lynn and tagged After Prison Show, Die Antwoord, handpoke tattoos, Inking of Immunity, jailhouse tattoos, Northwest Tatau Festival, Paka Polynesian Tattoo, Post Malone, Sarah March hand poked tattoos, Su'a Paul Sulu'ape, Su'a Petelo Sulu'ape, Suluape Skinz, tatau, tattoo. Bookmark the permalink.